b. Leaving protective styles in too long. I've learned that whether my hair was in twists, braids, a twistout, a wash n' go, or a fro my hair would grow and retain length all the same. c. I've slowly incorporated minor dosages of heat (blow dryer) that has left my hair incredibly soft! My boyfriend is actually a personal trainer!! If anyone is in Houston and needs help hit me up and I'll relay the message. Also, I have recently returned to college and I basically walk everywhere. It is one of, if not THE, largest unversities in the country. I burn a lot of calories, but I also stay hydrated with the h2o. Currently I am trying to gain weight. I don't think I've ever weighed over 105 a day in my life...and I'm tired of looking 14 when I'm 24! a. Don't listen to everybody...including me. If someone can add heat to their hair every 2 weeks or wear braids for 6 months straight and retain all their length don't assume your hair can. Always keep in mind that experimentation involves taking risks so take proper precautions and research! b. Protective Styling is not the only avenue. I know I know. Don't stone me. 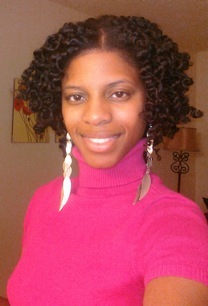 I love protective styling with braids, buns, twists, etc. But wearing your hair out or having your hair touch your shirt will not kill you every once in a while. 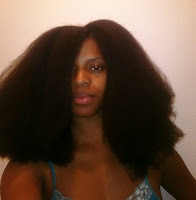 Enjoy your hair, keep it moisturized, wash it when you feel it should be washed, and find styles that suit you. It is as simple as you make it. 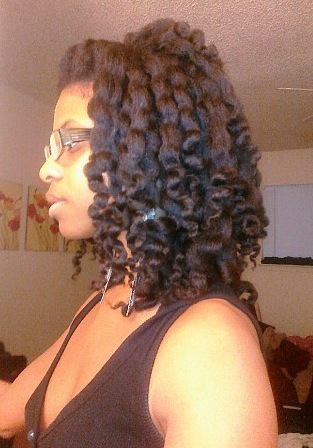 I also learned that my hair retains length well without protective styling and that shower detangling is not for me. "Don't listen to everybody...including me." I couldn't have said it better myself! My number one rule is to pay attention to what works for me, not anyone else. Great feature! I am glad Miss Alina was able to dispel and dismiss the myth that protective styling, when done in excess, is the only way to retain length. Some women with finer hair actually react poorly to protective styling of any sort. Especially when done for a long period of time. I think it is wonderful to rock protective styles (twists, braids, buns, etc. 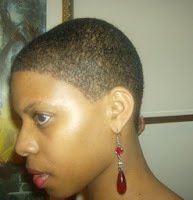 ), but I also think there is no harm in "letting your hair out" as often as you don't. Lenth will be retained, nonetheless. And healthy hair is worked from the inside out. The less you stress your tresses, the healthier they will appear. 19 months natural and happy..! her hair is beautiful, wow! I've missed your blog woman. I'm going to bookmark it on my blog so I never forget it again. And happy easter!